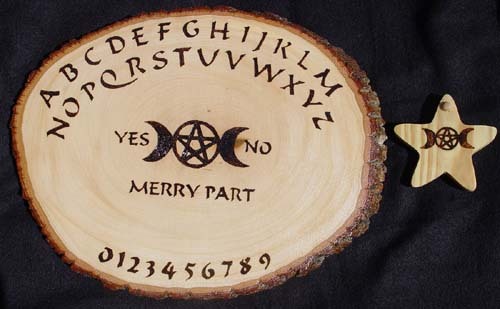 This beautiful hand made Spirit / Witch / Ouija board is made from Balsam wood. It is all hand burned and designed for Witches by Witches. The energy off each board is just fantastic!!! Please keep in mind since they are hand-made, each board is slightly different. We may be able to offer custom shades such as medium oak, mahogany and natural. Just ask, we'll let you know if we can do it. If you are ordering a custom shade, it is a custom order and we will need approx 4 weeks to create your item for you. Each one is signed on the back by the Artist who makes them.